1. To prepare the apples: In a large microwave-safe bowl, add butter, cover and melt in microwave, about 20 seconds. Stir in sugar, cinnamon and water. Fold in chopped apples. Mix well. Cook in microwave about 8-10 minutes, until apples are soft. The apples create a lot of liquid, once cooked, which you’ll want to use. Place the bowl of cooked apples in the freezer to cool, about 25 minutes or in refrigerator, for about 1 hour. 2. To assemble trifle: In a large serving bowl or trifle dish, place half the angel food cake pieces on the bottom of bowl. Sprinkle half the cooked and cooled apples evenly over cake. Dollop 1 package of pudding all over top of apples. Use the back of the spoon to spread around. Spread ½ container Cool Whip evenly over pudding. Use back of spoon to spread. 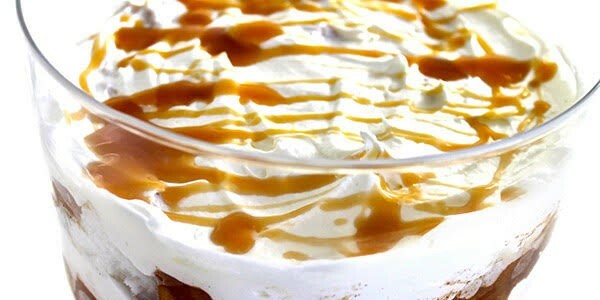 Drizzle 1½ tablespoons caramel syrup over the top of cool whip. Repeat the steps starting with angel food cake and ending with Cool Whip and caramel syrup drizzled over top. 3. Chill for at least 1 hour or overnight, before serving. Store any leftovers covered in refrigerator. You can freeze the leftovers too.